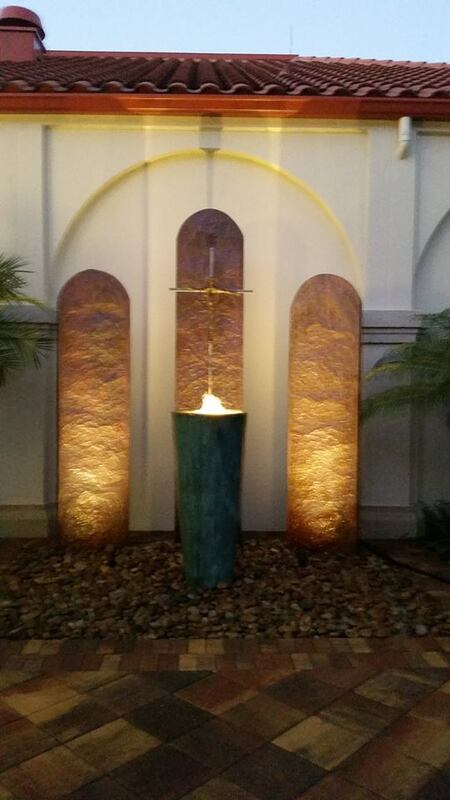 This visio divina reflection was done at Saint William’s Catholic Church in Naples, FL this Lenten season. I spent prayerful time at their newly established Courtyard of Mercy with this sculptured art crafted by artist Scott Lampitt of Pine Island, FL. I was deeply moved by the sculpture and provided a reflection for the parish. I am offering it as a reflection into Holy Week for the Seeing the Word community. 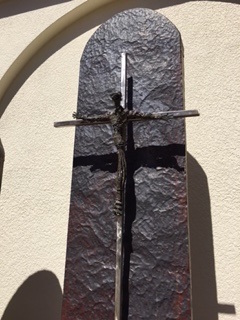 This sculpture in the Courtyard of Mercy invites me to rest and fix my sacred gaze on the crucifix, the tablets, and the garden of stone and bubbling fountain of water at the foot of the cross. Not to be missed are the pilgrim people, Sunday after Sunday who pass through this courtyard to open the church doors and join the pilgrimage to the Eucharistic table for a community celebration. This Courtyard of Mercy contains the same ritual movement used for blessing the Opening of the Door of Mercy that began this Jubilee Year of Mercy designated by Pope Francis: the solemn procession, gathering of the assembly, blessing of the door, the recognition of Christ as the gate through which we enter salvation, baptismal renewal, sharing in the Eucharistic feast, and a renewed sense of responsibility to be a living sign of the Father’s love in the world. I pause before the cross, standing in the rock garden. I remember those times when I had hit rock bottom and whispered, “Jesus, I have sinned, forgive me” and then I reach out to Jesus as he asked me to put my wounds into his side, into his hands and feet. I enter the wounds of Christ, seeking refuge in the wounds of his love. He bears my afflictions. For now, I no longer have to avert my eyes. I return my sacred gaze to the three tablets: one holding the corpus, and the other two—one to the left and the other to the right standing tall and blank. They reveal the very mystery of the Holy Trinity and the response is a fountain of joy, serenity, and peace bubbling up. The tablets are pounded, rippled and dented while a shimmering patina of red color is shedding through the surface. Mercy comes to meet me in the middle tablet where Jesus is nailed to the cross. The tablets inspire images of the old law, and the new law which is mercy. The tablets, shaped architecturally as doors, invite me once again into the life of God. Before I can enter these doors I need to lay down my stones, my judgmental words, and stop using the law as a weapon. I lift my eyes to the crucified Christ and notice the bold and funky hands that gesture an invitation to repentance and gratitude. Jesus, with arms outstretched, extends an invitation to me to proceed through the doorway of mercy where I am commanded not to sin again. I pass through the fountain of bubbling holy water, reach out my hand and make the sign of the cross from the waters of Baptism—the first sacrament of the new law—through which I was joined with Christ in his death and resurrection and became part of his Body. From the bench, I see the shimmer of water on the rocks, washing over and reshaping the nature of them, making rough edges smooth. The water twinkles in my eye and I am joined to the heart of God. This Courtyard of Mercy holds a rock garden—an image of paradise, drawing me towards eternal life with Christ—where all the rocks have been released, cleansed and laid down. I pray Merciful God as I cross from this rock garden to the threshold of the sanctuary that I may be filled with a sense of forgiveness and drawn to see and respond to the suffering of people that surrounds me. Move my heart to respond with the same mercy that I have received from you. Amen. Sculpture by artist Scott Lampitt. 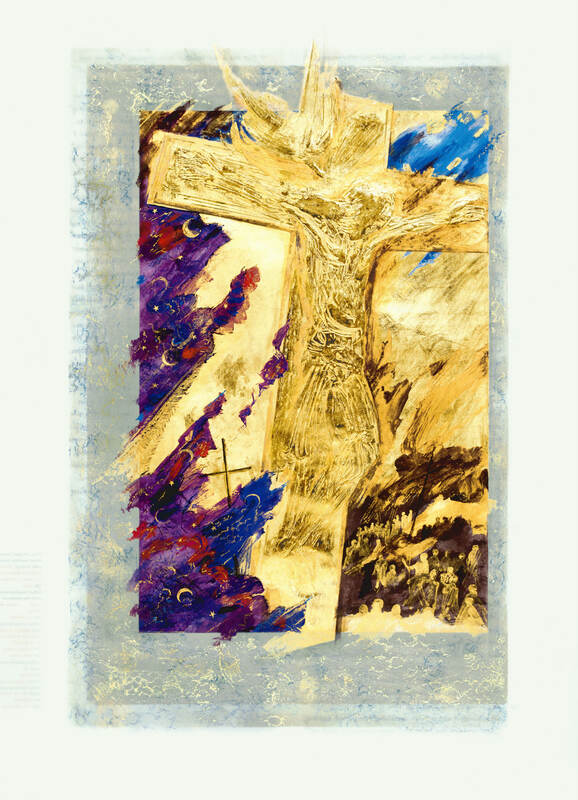 Crucifixion, Donald Jackson, Copyright 2002, The Saint John’s Bible, Saint John’s University, Collegeville, Minnesota USA. Used by permission. All rights reserved. Road to Emmaus, Sally Mae Joseph, Copyright 2002, The Saint John’s Bible, Saint John’s University, Collegeville, Minnesota USA. Used by permission. All rights reserved. Barbara Sutton, D.Min. is the Director of Field Education and Ministerial Formation and Adjunct Faculty at Saint John’s School of Theology and Seminary. This entry was posted in General, Lenten Reflection, Lenten Reflection 2016 by Seeing the Word Team. Bookmark the permalink. Thank you Barbara for your beautiful insight. It brings peace to my heart.